Femara (letrozole) is an oral, non-steroidal aromatase inhibitor, usually indicated for the treatment of hormonally responsive breast cancer after surgery and radiation. This medication lowers estrogen levels in postmenopausal women, which can slow the growth of certain types of breast tumors. It may be prescribed for women with ovulation problems, or for the ones with unexplained infertility, being used for ovarian stimulation. It also increases pregnancy chances in ovulating women. Health Care Fraud Costs U.S. $80 Billion A Year. How Much Does Health Care Fraud Cost You? Imagine losing a family member or loved one to what you thought was a cancer related death. One day you read in the newspaper that the Oncologist, Michigan doctor Farid Fata, has been charged with massive Medicare fraud, including giving $35 million in needless chemotherapy to patients. Now you are questioning whether or not the treatments provided by Dr. Fata were in fact even necessary and if those treatments could have been the cause of death. 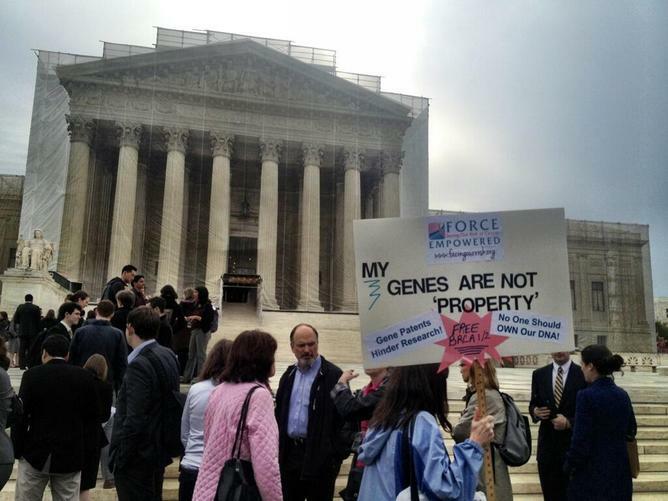 In a recent CNN article written by Bill Mears entitled: Justices at odds over patents for human genes, is reported that the US Supreme Court has heard on Monday arguments questioning whether the government should allow patents for human genes. The lawsuit centers on whether companies and scientists could patent human DNA extracted from the body like a mechanical invention. The case relates to nine patents on two human genes held by US biotech firm Myriad Genetics. Myriad Genetics isolated two related types of biological material, BCRA-1 and BCRA-2, linked to increased hereditary risk for breast and ovarian cancer. The company claims that the genes patented were “isolated” by them, making them products of human ingenuity and therefore patentable. There are two completely different opinions to this so moot question. Scientists and companies argue patents stimulate medical innovation and investment that saves lives. But patient rights groups and civil libertarians accuse the patent holders are “holding hostage” the diagnostic care and access of information available to high-risk patients. According to Justice Stephen Breyer, the patent law is filled with uneasy compromises, because on the one hand, they do want people to invent, on the other hand, there is a worry about them tying up some kind of whatever it is, particularly a thing that itself could be used for further advance. Justice Anthony Kennedy appreciated Myriad’s significant investment in time and money in its genetic studies and propounded that they might be given two-decade control over the genes for research, diagnostics, and treatment. But a “chocolate chip” cookie analogy made by Justice Sonia Sotomayor demonstrated pretty clear that it is impossible to get a patent just isolating naturally derived products only for the particular process or use of the cookie. Indeed, it seems nonsense to apply for a patent for the basic items of salt, flour and eggs, simply because a new use or a new product from these ingredients has been created. The patent system was designed long ago to encourage innovation, not to stifle scientific research and the free exchange of ideas and, what not less important is, not to discourage consumer accessibility to all new products. All applications for getting a patent need a close examination based on applicable laws, in order to make right decision between abstract ideas and principles, and more tangible scientific discoveries and principles. Medical science had traditionally avoided patents. The sun does not come into question, but for the past 31 years, US authorities have been awarding patents on 20 percent of the human genes to universities and medical companies. Nobody disputes the fact isolating the building blocks of life is not easy. Myriad has spent several years and hundreds of millions of dollars in its research. Myriad Genetics is the only company that can perform tests for potential abnormalities of breast cancer genes. An initial test usually registers most problems, but the company also offers a second test, called BART, to detect the rest, a diagnostic that can cost several thousand dollars. “Strong intellectual property and patent rights in the United States are critical to fulfilling our mission,” has said Richard Marsh, executive vice president and general counsel at Myriad. Myriad points out the benefit for 1 million patients from its BRAC Analysis technology. 250 000 BRAC tests continue to be performed each year. Everybody agrees that BCRA testing has saved many lives, giving at-risk women the option of having their breasts removed as a preventive measure. The average costs for the testing for patients is only about $100, as officials say. But there are others who disagree with these data. Some patients have complained about too high prices for a second test, blaming the company for more interest in profits than patient care for those who cannot afford the second analysis. The company refuses in its turn to admit this as a truth. Among those challenging the Myriad patents are sisters Eileen Kelly and Kathleen Maxian. Kelly was diagnosed with breast cancer at age 40. Maxian made a BCRA test to be sure she was not at risk. Fortunately, it showed “negative”, but later the second BART testing proved positive, meaning the siblings carry the cancer-causing mutation all along. Now the cancer is so advanced, that Maxian have only a 20-percent chance of being alive five years from now. Money was not an issue for them, but Kelly and Maxian, along with a coalition of physician groups and genetic counselors say Myriad has not made the BART tests widely available for patients without a strong family history of these kinds of cancers. But several justices raised concerns. The Supreme Court rejected the appeal court’s conclusions, and is now reconsidering the case. A ruling from the court is expected in June. For more detailed disputes and other arguments, please read the entire CNN article.